It would be more appropriate to be posting about this in November this year, but I picked up And We Go On at the library before Christmas, so here we are. Before I get into the rest of my thoughts, I will say that Will R. Bird's memoir about fighting in the Great War is essential reading. This is the first time I've read a soldier's memoir about any war, so maybe any other one would've had the same effect on me, but I really think that And We Go On is special. Britain was at war with Germany as of August 4, 1914, and because of its relationship to Britain at the time, Canada was at war with Germany as of that date as well. When the war began, it had been less than fifty years since Confederation. According to Veterans Affairs Canada, by the end of World War One (WWI), 650,000 men and women had served, 172,000 of those had been wounded, and 66,000 had lost their lives. This from a population of about 7.2 million people total, mostly British-born. As I write this, there are no known surviving Canadian veterans of WWI. Will R. Bird (called Bill in this book) was born in Nova Scotia in 1891. He was 23 years old when the war began. He tried to enlist in August 1914 but was rejected due to having broken teeth from playing hockey—the most stereotypically Canadian thing I've ever heard—then was rejected again that fall because his youngest brother, Steve, had already joined up and requested that Bill be turned down. Steve went to France in September 1915 and died there the following October. Only fragments were found of him and a dozen of his comrades. I was working in a harvest field in Saskatchewan, pitching sheaves on a wagon, when Steve walked around the cart and confronted me. He said not a word but I knew all as if he had spoken, for he had on his equipment and was carrying his rifle. I let the fork fall to the ground and the nearest man came running to me, thinking I had taken ill. I did not tell him what I had seen, but I left the field and never pitched another sheaf of grain. That is where Bird's war experience begins. Not long after his brother's ghost appears to him in Saskatchewan, he returns to Nova Scotia and finally manages to enlist. He serves with the Royal Highland Regiment of Canada (the Black Watch—I have to admit I'm a bit baffled and haven't managed to find confirmation of this, but I think these men were actually wearing kilts in the trenches). Steve appears to his brother many more times after the catalyst episode, either by sight or touch, warning him of impending danger. Bird maintains the veracity of his brother's ghost, and I often found myself believing him. Certainly what he writes feels sincere. 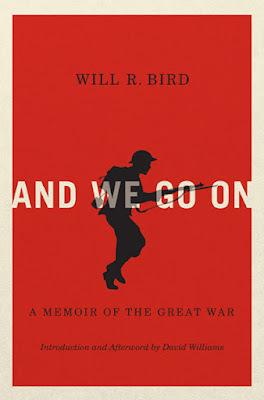 Other than the ghost, the book is a straightforward account of Bird's experiences from his arrival in Britain in 1916 to his return to Canada in 1919. He missed Vimy Ridge due to a case of the mumps, but he was at Passchendaele and various other notorious battlefields, and compiled the book from diaries he kept at the time. His writing style is simple and almost Hemingwayesque. He's accompanied by a long list of brothers in arms (Mickey, Tommy, Waterbottle, the Student) who are killed with tragic regularity. There's more vitriol directed at officers and so-called "platform patriots" in this book than toward the enemy soldiers. It's not a fun read by any means, but it's vital and arresting. It's the always-necessary reminder that the men who fought in WWI and many wars since were very young men who didn't always know what they were getting into or really why they were getting into it. I think that's the most important thing. One hundred years later, it's easy to forget that a soldier in WWI was just a young man with his own experience, his own motives, and his own imperfect understanding of war and his participation in it. On November 10, 1918, Bird was watching more of his friends dying as they liberated the Belgian city of Mons. The armistice was signed on November 11, 1918. From Fosse 10 we went to Noulles mines and were billeted in the town. The Hun shelled it the next day and killed a few of the civilians, one a little girl from the house where we were staying. I helped the mother pick her from the street. Her eyes were open, looking up, her hair thrown back from frightened, pinched features, a frail little elf, who had smiled at me and shyly called me "Canada." Bird thinks of Canada rarely, and without much nationalist fervour or patriotism. The modern legacy of Canadian bravery in the Great War hangs uncomfortably close over the narrative. Most of all, the book is an effort to reveal the damage done to fighting men, even if they aren't physically wounded, to express the inexpressible. Speaking to each other on the boat home to Canada after the armistice, Bird is talking to his friend Sambro about what the two of them are bringing back from the war. Bird had several "souvenirs" stolen from him at Mons, and they are looking at another soldier who has lost a leg. "I'll let them take a leg off me or an arm, any old time," [Sambro] said, "if they'll take the pictures of the war out of my mind."